You may know all about Germany’s impressive cities: Berlin, Frankfurt, Munich, to name a few, but how much do you know about the country’s lesser known natural beauty spots? From North to South, discover our pick of Germany’s top beauty spots for an epic road trip across the country. The first stop of this promised-to-be epic road trip? Rakotzbrücke, otherwise known as the Devil’s Bridge! 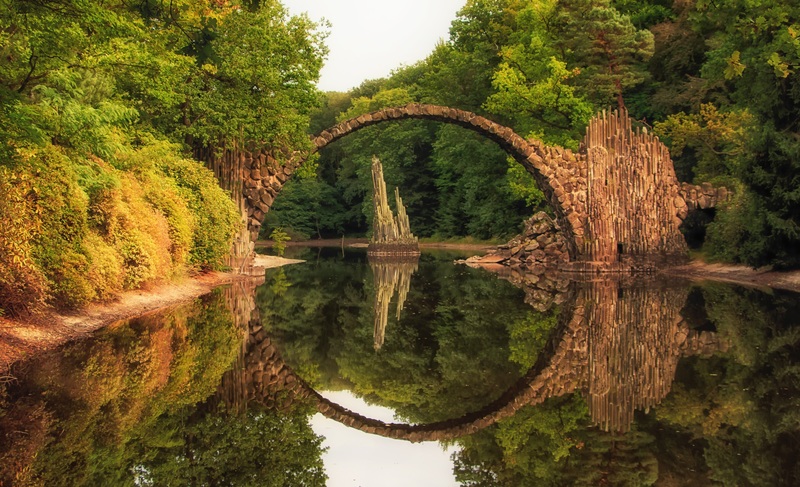 This stunning bridge, located in Saxony in North Germany, was built in medieval times. Legend has it that the devil helped build the bridge in exchange for the soul of the first human who crossed the bridge. But fear not, this bridge was built by humans! 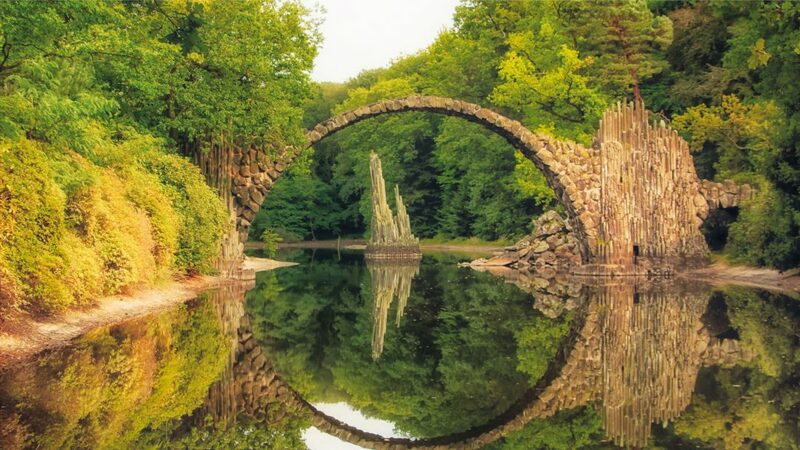 The bridge was built in such a way so as to form a circle when reflected in the waters. 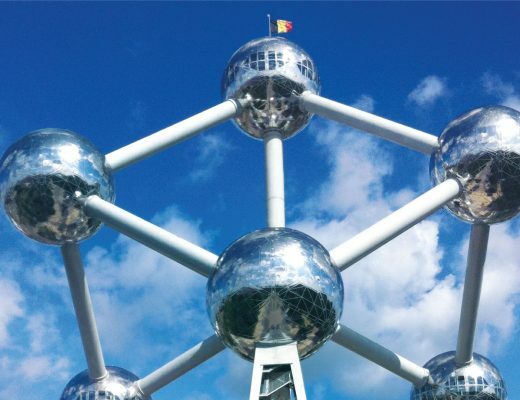 Checking out its extraordinary beauty is the perfect starting point for a memorable journey across the country. 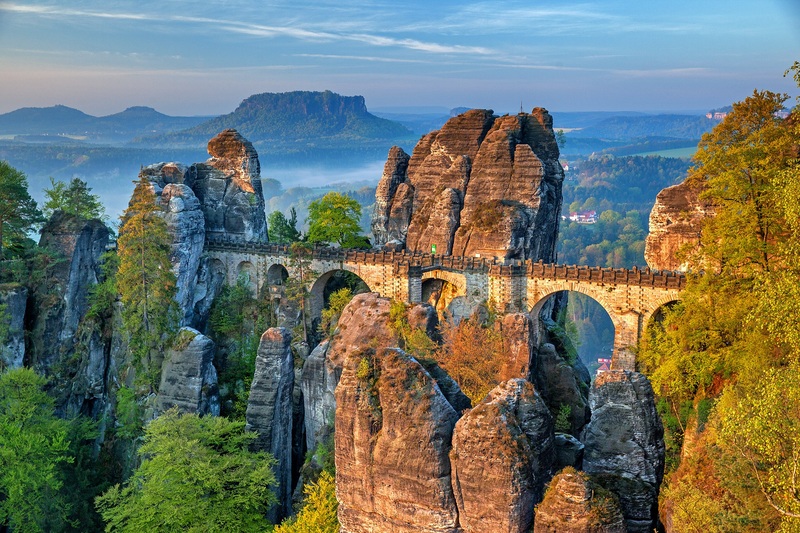 Bastei Bridge is the highlight of the region of Saxony. As a stunning rock formation at 194 metres high, Bastei is undoubtedly the most impressive site in Saxony’s National Park. The region is known for its gigantic sandstone rocks and lush green forests. Built right in the heart of the park, the bridge offers panoramic views of the region. To explore the area further, you can choose to go on one of the region’s many hiking trails or stop for an ice cream by the River Elbe. 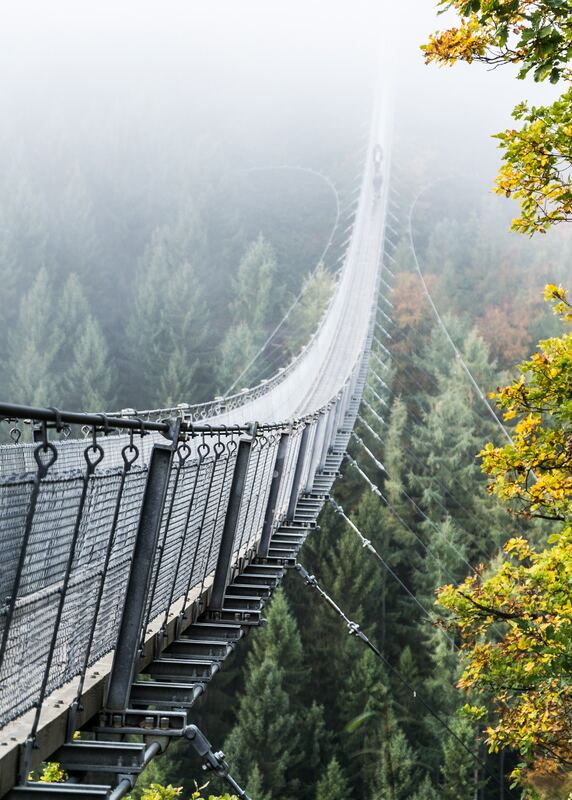 The longest suspension bridge in Germany is undoubtedly a site worth checking out. At 360 metres long and 100 metres high this spectacular bridge is sure to give you an adrenaline rush. Not for the weak-hearted, the bridge promises stunning panoramic views over the lush green landscape. You can combine it with a hike, or you may consider the stroll across the bridge as a hike itself as it’s a 2.5km walk one way! Also known as Saar Loop, Saarchleife refers to the spectacular natural spot where the river Saar does a loop around the forest. There are numerous hiking and cycling paths you can choose from that lead up to the loop, or you can choose to go to the observation tower at the treetop path. 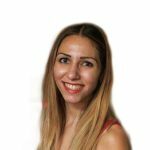 This is no ordinary observation tower: at 42 metres high this observation tower overlooks the entire loop as well as the surrounding forest and countryside. Make sure you take a camera with you to capture the breathtaking views. If you are looking to fit in some exercise during your travels, what better way than hiking up to the beautiful Lake Schrecksee? 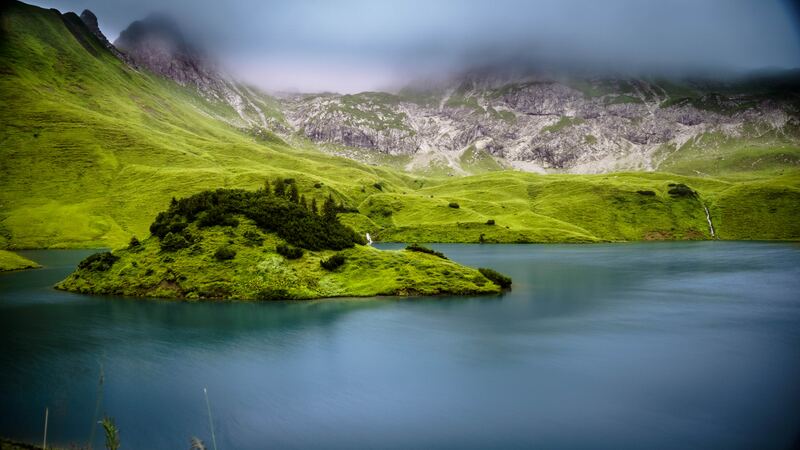 As the highest Alpine lake, it’s well worth the hike to reach the stunning valley. With different hiking paths and routes available, you can opt for an easy option or do the full two-day hike. And if you feel that you are in need of a shower after reaching the top, you can always go for a swim in the lake! Stunning views, refreshing waters and some exercise… the ultimate way to discover one of Germany’s most beautiful natural spots. Neuschwanstein Castle is the ultimate real-life fairytale castle. Literally located on a hill, above the village of Hohenschwangau, it’s no wonder this castle is one of the most visited castles in Europe. 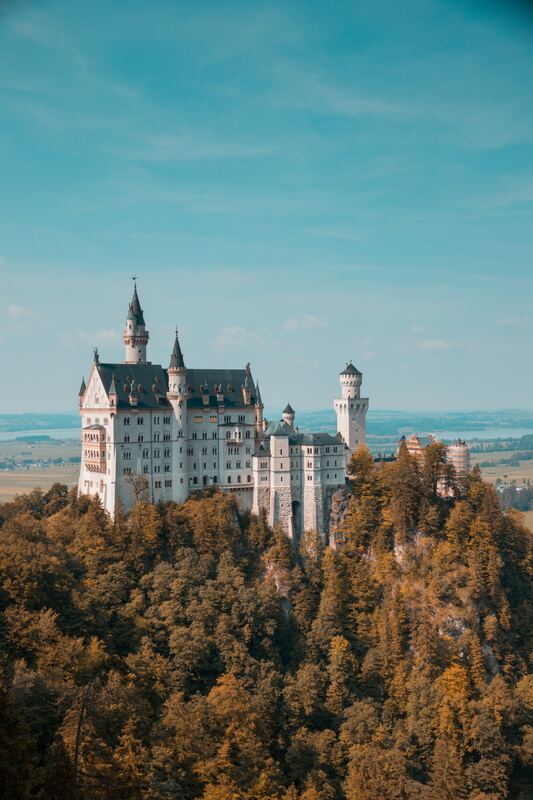 Following the death of King Ludwig, who allegedly used the castle as his refuge to hide from the public eye, the castle was opened to the public and it has been one of the most popular attractions of the country ever since! A sight worth stopping for when driving through Bavaria. Impressive waterfalls and peaceful water basins, it’s no wonder Partnach Gorge is considered a natural monument. 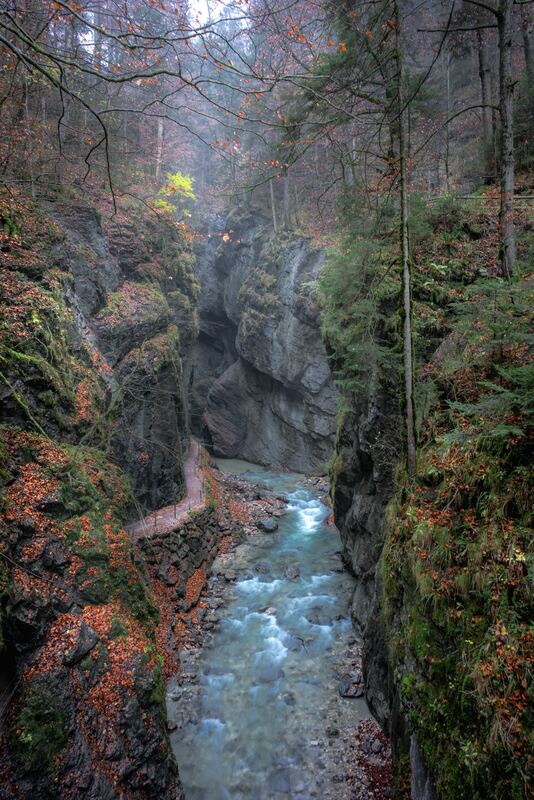 The Partnach river leads up to the stunning gorge whose walls rise up to 80 metres. With two different paths to chose from, you can follow the river to reach your destination, or you can opt for a romantic horse-drawn carriage to get there. Offering cool relief with its watery paths in the summer and mesmerising snowy views in the winter, Partnach gorge makes for a great destination any time of year.